On the morning of Sept. 30, the European Space Agency's Rosetta spacecraft crash-landed on the Comet 67P/Churyumov-Gerasimenko, ending a 12-year mission to study a comet like never before. Launched in 2004, the Rosetta spacecraft visited asteroids before arriving in orbit around Comet 67P in August 2014. In November of that year, Rosetta's lander Philae made a historic landing on Comet 67P — a major space feat. Artist's illustration of Europe's Rosetta probe ending its mission by touching down on Comet 67P Churyumov-Gerasimenko on Sept. 30, 2016. Rosetta captured its last view of Comet 67P on Sept. 30, 2016 from an altitude of about 65 feet (20 meters). Today (Sept. 30) marks the end of operations for the European Space Agency's (ESA) historic Rosetta mission, and the mood felt almost funereal as the postlanding celebration began. The Rosetta probe drifted down to the surface of Comet 67P today (Sept. 30) and ended its 12-year mission. At around 6:40 a.m. EDT (1040 GMT) today (Sept. 30), Rosetta is scheduled to crash-land intentionally on Comet 67P/Churyumov-Gerasimenko, ending the European spacecraft's epic 12-year mission. The European Space Agency has commissioned a sequel to the short film "Ambition," honoring a historic mission that's about to come to a dramatic end. Europe's Rosetta spacecraft will end its mission Friday (Sept. 30) by landing on the comet it's been orbiting for the last two years. As Rosetta closes out its dramatic mission with a descent to Comet 67P/Churyumov-Gerasimenko, the European orbiter joins a long list of cometary and small-body missions that have helped us learn more about the early solar system. 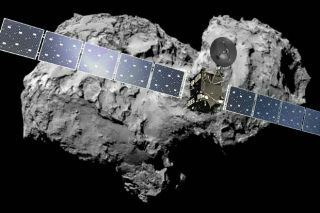 The European Space Agency's Rosetta probe will meet its demise on September 30, 2016 when a maneuver is performed to make it crash into Comet 67P/Churyumov–Gerasimenko. This visualization shows the descent, but stops short of it crashing. The first spacecraft to orbit a comet will end its historic mission on Friday (Sept. 30) with a crash landing. The European Space Agency's Rosetta probe will plummet it into the surface of comet 67P/Churyumov–Gerasimenko on Sept. 30th, 2016, putting an end to the mission. Take a look back at the historic mission through the lens of ESA and Euronews. After 10 years and 4 billion miles, humanity's first spacecraft to land on a comet has reached its destination. The European Space Agency's Rosetta mission has landed its Philae probe on the surface of Comet 67P/C-G.
Scientists and space fans aren't the only ones excited for ESA's historic comet landing. See how Google joined the celebration. This is the view you would have seen if you could have taken a ride on Europe's Philae lander as it descended to the surface of a comet. The first photos are out of ESA's unprecedented comet landing attempt. See photos of Philae lander's departure from its Rosetta mothership here. Follow us @Spacedotcom>, Facebook and Google+.